*If you missed my first Camping Diaries post, find it here! It’s the last week of school but can I be honest for a second? I am so ready to be out with Penny Lane the Pop-Up enjoying the woods. Which is why we said heck with it all, and took her out for an inaugural trip this past weekend. Winter was long around these parts, what with the snow and cold stretching through April. Needless to say, my soul is struggling with being inside as Spring has finally arrived. 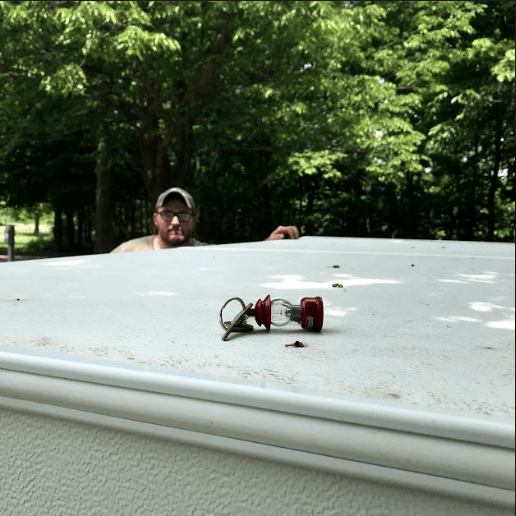 Since we purchased our pop-up camper in March, we’ve done nothing but talk about camping–when and where we want to go this summer–and if we need to do anything to the camper before we head out. Really, she’s in great condition and only needs a bit of a face-lift inside. 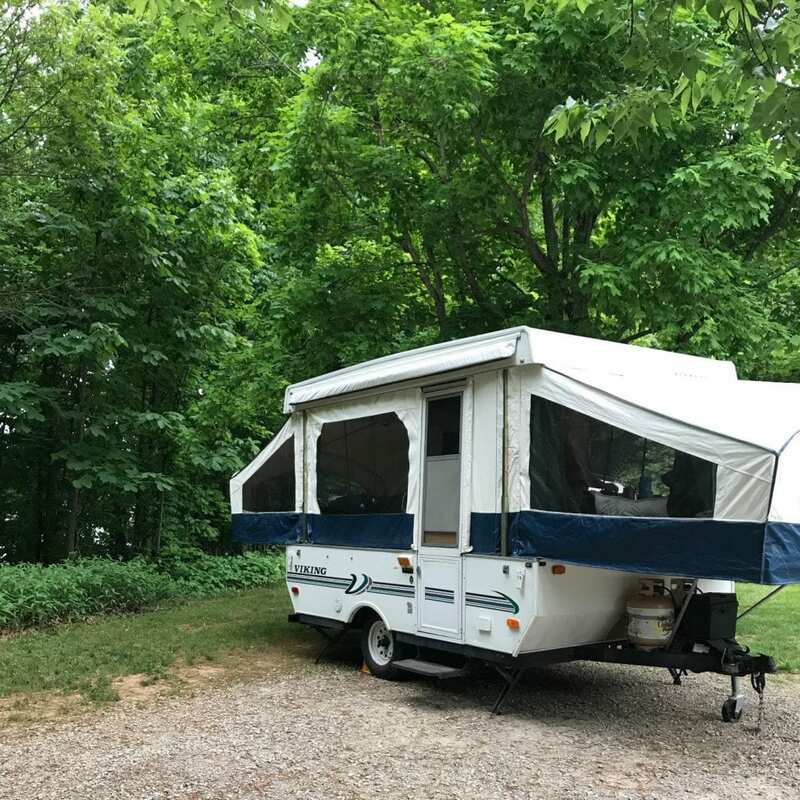 But before we head out on any long trips this summer, we decided we should go to a local campground as a test run to see what else we need in terms of camping gear for trips and the camper. I know I mentioned in my first Camping Diaries post that we don’t really live close to great camping spots, and by great spots I mean–we’re too far away from Colorado, my dream camping location. 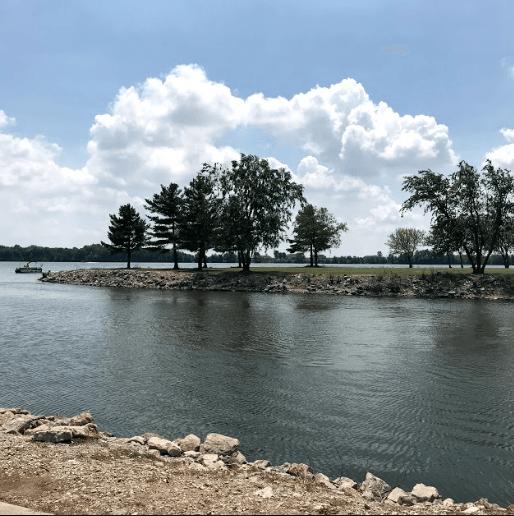 But surprisingly, there’s a state recreation area not too far away from us that offers a nice campground, some hiking, and a little beach close by. So, we packed up Penny Lane, the pups, and headed out for the weekend ready for adventure. Our first trip brought some good lessons. God’s funny sometimes. Just when you think He isn’t listening, He is and He’s ready to show you. I thought this weekend would just be a nice, relaxing weekend in the camper learning what we needed to make future trips run smoothly, but of course, God was all “Nope.” He had a little more up His sleeve. I mean, when you decide to live deliberately, you better expect something. Be flexible. Be willing to let go. I used to be someone who couldn’t do anything without having coffee first thing in the morning, but since I discovered I have a sensitivity to caffeine last year, I only drink decaf. Coffee is more about the experience now. And let me tell you–coffee on a cool morning outisde is an experience I love. 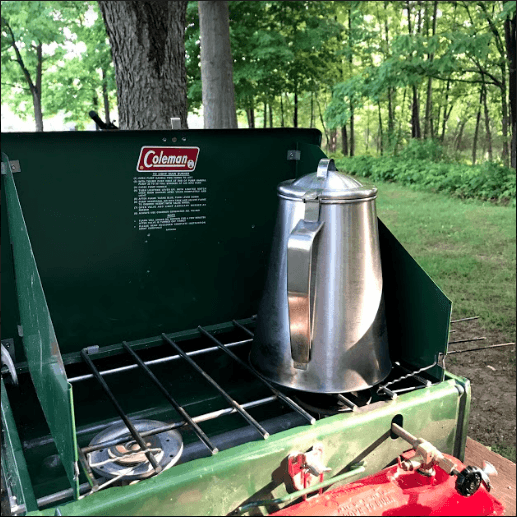 But, as this was our first trip and we were working with some old school camping equipment, it took a little more to get my coffee game on. The stove pictured above is literally the one we used when I was a kid with my Grandma, so it’s got some use in it as well as good memories. We discovered the hard way that the fuel lines needed a good cleaning out, and we weren’t going to get much use out of it this trip. Thankfully, we picked up some firewood before we made camp, so rather than cook over a camp stove, we used the fire pit for everything, including coffee on Saturday morning. It was a good lesson in patience and flexibility. I tend to be a type-A personality, so it’s sort of odd to me that I love camping so much because it pushes all my buttons of control and go-go-go. I’ve been slowing down over the last year or so, and I found the little hiccups in our meals this weekend were a good reminder that even though we plan for things, they don’t always turn out the way we expect. 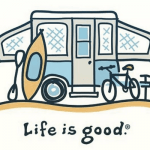 My soul heard the nudge that I need to be more flexible and willing to let go of some of my plans, whether it’s how I plan on cooking food while camping–or other life plans that just aren’t working how I’d hoped they would. Until we were out in the woods, I’d forgotten just how slow and relaxing camping is (once you get the campsite set up that is.) Our initial plan was to camp out Friday & Saturday night, returning home Sunday afternoon but we woke up early Saturday morning with a bit of rain. It was actually great hearing the rain on the canvas and and was a wonderful moment to wake up too. Eventually, the sun came out, but the forecast showed storms through the evening and Sunday morning. Since we didn’t want to pack up Penny Lane in the rain, we ended up coming home Saturday afternoon, cutting our trip short. We were only out less than 24 hours, yet I still felt as if we’d been gone for a week. We sat by the fire Friday evening rather than watch Netflix, and woke early with the sunrise rather than sleeping in. Our morning was relaxed as we walked the dogs, cooked breakfast together, and then cleaned up. Mid-morning found Casey and the pups napping while I got lost in a book. The we hiked over to the camp store and were surprised by a little restaurant, picking up lunch to take back with us before we tore down camp and headed home. Less hustle breathed more life into our hours, and by the time we packed up to head home, I was sad to go but refreshed for this last week of school and excited for the adventures to come. All in all, if was a great first trip that almost ended in disaster when we couldn’t find our camper keys after looking everywhere. Of course, silly us had both keys on one king ring which meant we were going to have to buy a whole new handle and lock for Penny Lane. That is until we tore camp down, lowered the camper, and found the keys sitting on the roof. Funny how the things you need the most turn up at just the right time. Trip 1 is in the books and I’m counting down until the next one! Alright veterans campers–what advice do we need to know next time we take out the pop-up?